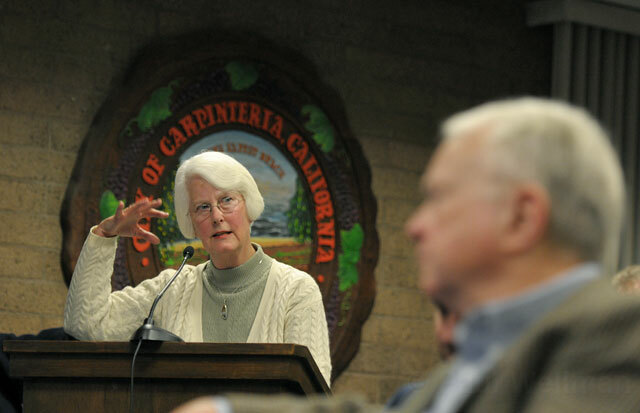 Former Carpinteria Mayor Donna Jordan speaks about many concerns with oil production in the area. 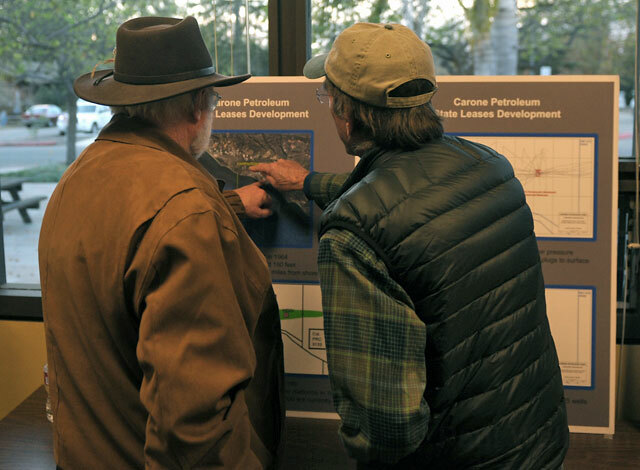 It was standing room only at two separate hearings in Carpinteria Thursday as residents and watchdogs came out to sound off on the latest oil drilling project proposed for the waters just west of the small seaside hamlet. 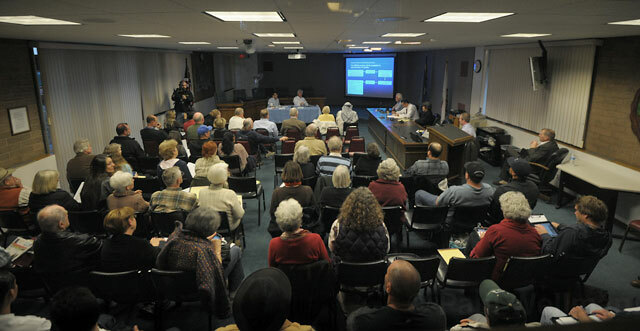 The hearings, one in the afternoon and one in the early evening, and both held in Carpinteria’s City Council chambers, marked the first opportunity for the public to weigh in with their questions and concerns about the possible environmental impacts associated with Carone Petroleum Corporation’s unorthodox plan to expand its existing drilling efforts from Platform Hogan, located in federal waters, in such a way that the energy company would access oil located within state water boundaries. In short, at least for proponents of the plan, the meetings did not go well. It was less than two years ago that residents of Carpinteria resoundingly rejected, via a landslide vote, Measure J, an initiative that would have paved the way for Veneco Inc. to use extended-reach, slant drilling methods to access some of the crude lurking beneath state waters just offshore. 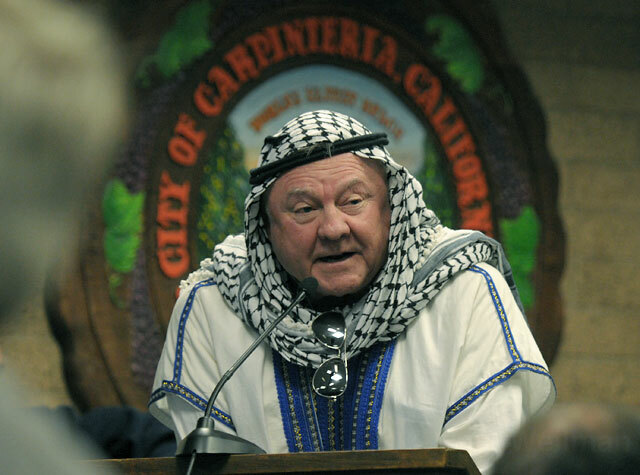 This anti-oil-harvesting sentiment was repeatedly referenced on Thursday as public speaker after public speaker expressed their worries about Carone’s plan and what it could mean for both the onshore and underwater environmental health of the Carpinteria area. Other areas of worry brought up during Thursday’s scoping hearings included what the slant drilling might mean for the extensive underground aquifer that provides Carpinteria with its drinking water and is the lifeblood for the community’s agricultural industry, what would happen with the mud generated from the increased drilling, would fracking be involved, how would oversight work due to the bifurcated nature of the proposal (drilling from federal waters into state waters), and what, if any, precedents would the unusual project be setting if it gained approval. According to folks from Carone, who were on hand Thursday with a table of information about their plans, the risks associated with their proposal are not nearly as dangerous as many of the public commenters fear them to be. Explaining that the oil levels in the reservoir they hope to tap are so low that the harvested crude, when piped from Hogan to the existing facilities at La Conchita, would be at such low pressure levels that a well blowout would be, in the words of one of the diagrams on display, “impossible.” Further, besides potential downsides highlighted by the majority of public speakers, the project also has potential upsides such as job creation and millions of dollars in potential tax revenues for the state. Technically speaking, Thursday was the public scoping hearing for the project’s Environmental Impact Report (EIR) process. Based on this week’s testimony and written comments submitted to the California State Lands Commission up until February 21 (the federal Bureau of Ocean Energy Management is also helping preside over the EIR process), the extent and scope of the EIR will be developed. A draft EIR, which is being prepared by Ventura’s Marine Resources Specialists, is expected to be completed by the end of the year.